As kids, we all believe in magic of some kind or another—monsters under the bed, or faeries, or wishes. But just because we have to grow up and face the very un-magical realities of rent, tax, and other bills doesn’t mean we have to lose our faith in miracles and lucky breaks. Every year, millions of hopeful people across the United Kingdom take a chance on their lucky stars by buying lottery tickets—and thousands win life-changing prizes. 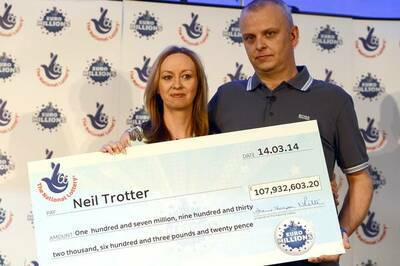 Here’s everything you need to know about some of the UK’s biggest lottery winners. Imagine skyrocketing from being a pretty unremarkable average human to suddenly being worth more than singer Adele (who hefts a net worth of £125 million). 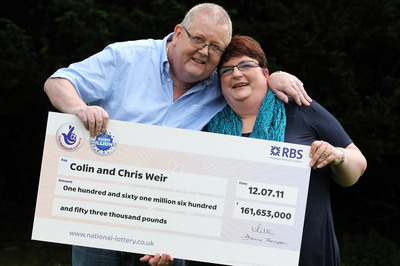 That’s what happened to husband and wife Colin and Chris Weir of Ayrshire, Scotland, when they bagged a sensational £161,653,000 EuroMillions jackpot—the record for the biggest win in UK lottery history—in July of 2011. The couple reportedly said that they were "tickled pink"—more than an understatement, we’re sure! Mr. and Mrs. Weir have been married for over 30 years and have two children. “We're not scared of this,” they said, after announcing their win to the world. “We're just going to have fun.” Who wouldn’t have fun with that much loot to their name? One the first things the Weirs did with their new riches was buy their dream home: a gorgeous mansion in Troon, Scotland. They forked out £3.5 million on the home, including furniture and fittings. They also stocked up on a fleet of cars and donated large amounts to various charities and charity funds, in the areas of recreational facilities, animal welfare, and cultural preservation, among others. 41-year-old car mechanic and self-proclaimed motor racing fanatic Neil Trotter bragged to his co-workers and staff one Friday afternoon in March 2014 that by "this time tomorrow" he would be a multi-millionaire. That night, in a stroke of unbelievable luck, he scooped a massive EuroMillions jackpot of £107.9 million, making him the National Lottery's fourth biggest winner. Neil’s winning numbers were 6, 24, 25, 27, 30 and Lucky Stars 5 and 9. He told the press that he planned to buy his 10-year-old daughter a pony, as well as splurge on a couple new supercars for himself, and a new home in the countryside for himself, his daughter, and his partner Nicky Ottaway to settle into their cushy new life as multi-millionaires. The only thing better than pizza is becoming millionaires in the blink of an eye. So when middle-aged couple Adrian and Gillian Bayford landed the UK’s second biggest lottery win ever in August 2012, the first thing they did with their winnings was take themselves, their 6-year-old daughter, and their 4-year-old son out to Domino’s Pizza to celebrate. However, more than just the Bayford children benefited from the £148,656,000 EuroMillions jackpot. Gillian is quoted as saying, "Children's charities are close to our hearts, so we will be exploring how we can use this money to help those charities." Despite being among Britain’s richest, Adrian kept working at the music shop he co-owned in Haverhill, Suffolk. Gillian, however, who worked as a healthcare assistant, quit her job instantly after banking the lottery cheque. In a story fit for the juiciest tabloids, the couple got divorced a year after their win. They denied rumours about an affair being the reason behind the split. Talk about a nerve-wracking week! 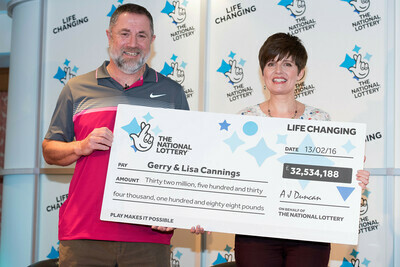 After finding out that she and he husband Gerry were the sole winners of a £32.5 million jackpot—the second largest jackpot ever won in the UK Lotto's history—Lisa Cannings carried the winning ticket around in her handbag for a week before claiming their prize. While £32.5 million might not sound like that much in the light of other winnings, it’s useful to remember that the Lotto jackpot is currently capped at £22 million – a cap that was introduced not long after the Cannings scooped their fortune. The couple, who have been married for over 13 years, beat impossible 45 million-to-one odds on winning the jackpot. The lucky numbers were 15, 16, 23, 39, 48 and 59. Gerry bought the ticket when the family went out one Saturday night for fish and chips, instead of staying home to have a home-cooked dinner. “What this money brings is a chance to enjoy new experiences and see places we thought we wouldn’t get to see,” Garry shared. As they are great Lord of the Rings fans, top of their list was New Zealand, where they hoped to get to see the set where the epic fantasy movies were filmed. As children’s author Roald Dahl once wisely said, “Those who don't believe in magic will never find it.” These winners show us that it’s always worth taking that chance. After all, you never know when you might become richer beyond your wildest dreams.